← Sometimes keeping it simple just won’t work. 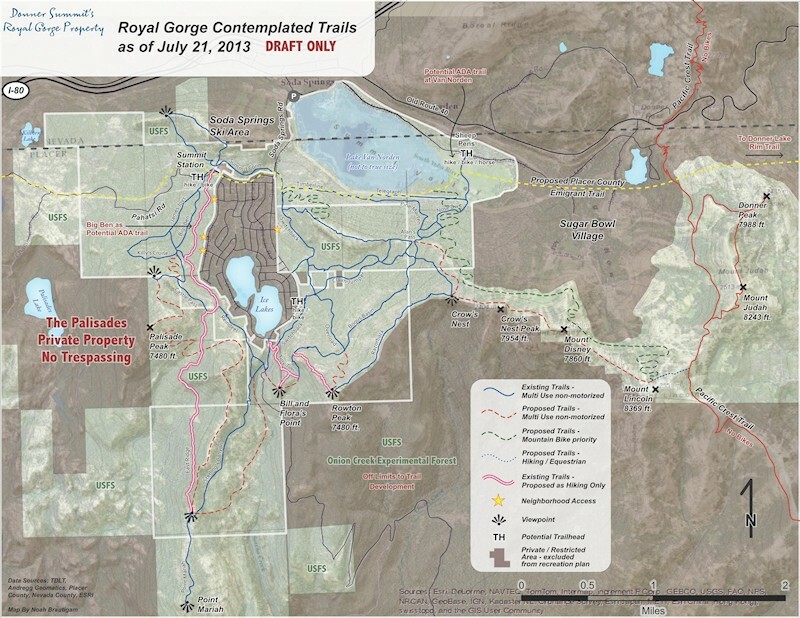 Ever since the acquisition of the Royal Gorge property in Dec of 2012 by the Truckee-Donner Land Trust (TDLT) we have all been waiting to get a glimpse of their new plan for the use of the property as public open space. 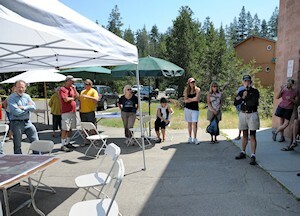 Our vigil ended this summer on July 21 when the TDLT presented their first draft of a proposed trail map for the area. The meeting was held in the Serene Lakes community at the firehouse. 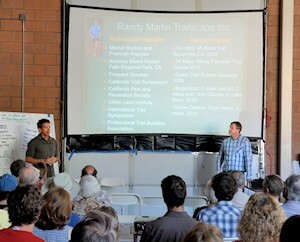 The plan was introduced after a very informative presentation on trails given by John Svahn, Stewardship Director at TDLT, and Randy Martin, president of Trailscape. The presentation was well attended and after the presentation there was an outreach session in which 12 stations were set up for small focus groups to express their feedback on the new plan. I was lucky enough to man one of these stations and hear what people had to say. In this post I would like to discuss my impressions of the plan as well as some of the feedback that it has generated. Let me say up front that I think that TDLT has come up with an excellent plan for the area. The beauty of the plan is that it makes every effort to accommodate all non-motorized users of the the area, hikers, bikers and equestrians. I believe that most people that come up here are tolerant of all non-motorized uses. However, there is a small group of mostly hikers that don’t like bikes and horses. And let’s face it, it only takes one bad egg mountain biker screaming down a trail or an inexperienced horse person galloping along to ruin it for everyone. Multi-use trails are used in many areas and they work well when good trail etiquette is practiced and a comprehensive education program is put in place to insure conflict free trails. I know that conflict-free trails is a primary goal of this land trust plan and that they intend to work with the user community in an ongoing effort to insure this goal. One of the important points that came out in the trails presentation is that there will be about 9 miles of new trail constructed. Most of this will be for alternate routes for mountain bikers to specifically avoid downhill conflicts with hikers and equestrians. John Svahn understands where the potential conflict areas are and also understands that problems usually arise when mountain bikers are looking for a thrilling downhill run. He has very wisely designed the new trails to take the thrill seeking mountain bikers over towards Crow’s Nest and Sugar Bowl and is designing trails that will give the thrill seekers what they want while also being ecologically sustainable. This will effectively separate the thrill seekers from the more casual mountain bikers as well as hikers and equestrians and should go a long way to alleviate trail conflicts. Concerning horses, the land trust has made the decision that equestrians will have access to the entire property. I think that they were correct to put the horse trailhead at the Sheep Pens in Van Norden Meadow. It is the only place on the property that could really support the parking for horse trailers. An argument for a trail head across from Summit Station could probably have been made, but in reality that would have been pretty tight, especially when shared as a hiking/biking trailhead too. Access from the Sheep Pens would favor more use of the east side of the property although there is access to the west side of the property. What I hear from my equestrian friends is that most riders will want to come up and camp at the horse camp in Cisco and then access the property for a day ride. I would think that anyone that makes the effort to trailer up their horse and drive up here, really wants to get a good long ride in. I think the land trust realizes this and wanted to make as much of the property available as possible to satisfy that need. There is just no getting around the added impact that horses bring to the area, but I think John and Randy are planning on beefing up the trails through good trail design to support that added impact. To a person, everyone likes the plan and is glad to see that TDLT is investing the time and effort to make the area open and accessible. A large majority of people that I have talked to approve of the multi-use policy adopted for the area. Many expressed willingness to share the trails with all categories of user. Others expressed concerns about conflicts between different types of users, but felt that with proper design and signage that multi-use could work. I did hear from a few people that as hikers they did appreciate that the plan included some trails restricted only for hiking and that they were concerned about sharing the trails with mountain bikers and equestrians. It was interesting however, that when I explained that most of the trails are wide and have good sight lines that the response was more accommodating to sharing the trails. Conversely, there were several users, primarily of the mountain biking persuasion that did express their opposition to restriction of trails to hiking only. Many of them felt that they could safely share the trails with hikers and did not see the need for restrictions. It was obvious that this will be an ongoing bone of contention in the trail design process. TDLT is planning on gathering feedback on their plan through August and incorporating it into a final plan by the end of the summer. Whatever the final plan for development of the trail system, it will be required to undergo environmental review under the state CEQA process. This will mean that implementation of the plan that will translate into trail improvements will not start until the summer of 2014 at the earliest. The plan is an ambitious one and will probably take a couple of years to implement fully. I would expect that it will be more like the summer of 2015 that we see most of the improvements implemented. That is not to say, however, that TDLT will not be making changes sooner. Keep in mind that most of the trails in the area are the remnants of old logging roads that were never designed for use by hikers, bikers or equestrians. Many of the trails fly in the face of good trail design and all of them have been neglected for years. TDLT has already identified many sections of trail that are problematic due to erosion control and they will start working on the critical ones this year under an erosion exemption. We should start seeing improvements in the trails starting this year. I don’t know about all of you, but I am really looking forward to all the improvements that are going to make this area even better that it is now, if that’s possible. See you out on the trails! Great job George! This is our presentation on the 24th!